A little over a year ago, I wrote about a new yarn subscription service I had just tried out. This was the Darn Good Yarn of the Month Club. I continue to have this subscription. And I thought I ought to revisit this service and give an overview of my experience. 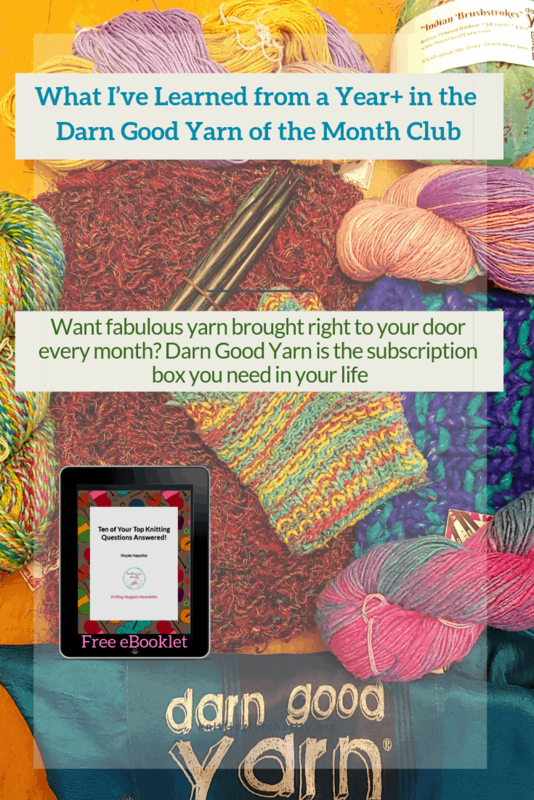 What exactly is the Darn Good Yarn of the Month Club? 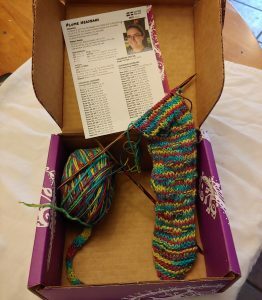 In a nutshell, for $10 a month (plus shipping costs), you’ll receive a skein of exclusive Darn Good Yarn of the Month Club yarn. You’ll also receive a pattern with which you can use the yarn, as well as a special gift. The special gifts have varied wildly! I’ve received everything from a set of chunky and short DPNs to a shimmery tote bag to stitch markers to sheep charms to bookmarks to buttons. I never have any idea what kind of gift I’ll receive next, which is definitely part of the fun. The yarns have also varied, though not quite as wildly. 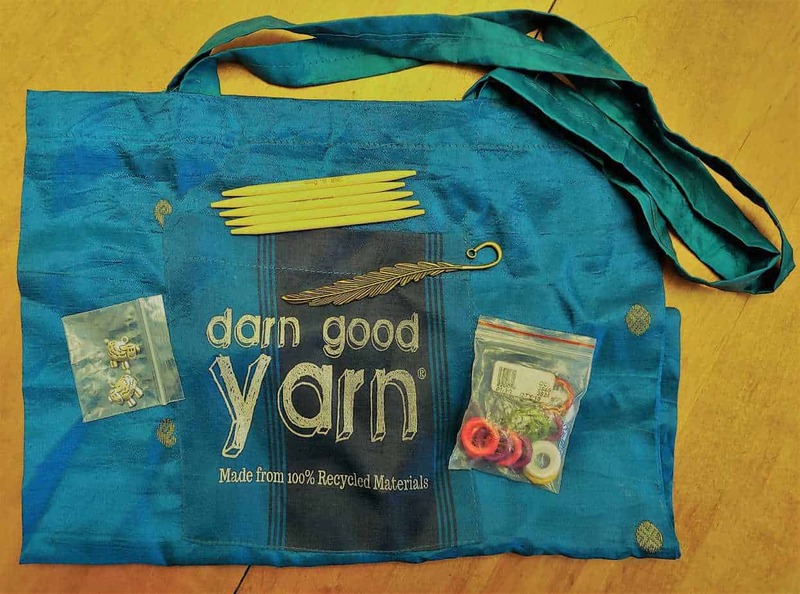 Various recycled silk yarn has definitely been the most common thread. I think I’ve received about 7 different skeins of recycled silk. 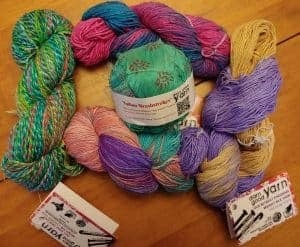 I’ve received yak wool once or possibly twice, sari silk ribbon yarn once, another ribbon yarn another time, and even banana fiber. The one thing all of the yarn has had in common is that every one has been gorgeous! I’ve used the accompanying patterns only a few times. Usually I’ve come up with my own plans for the yarns. I’ve made headbands a few times, a cowl once, a shawlette once, and even a small pair of fingerless mitts. I’ve even arm-knitted a scarf! I do like receiving the patterns, even when I don’t use them, because they usually lead to other ideas as to how I can use the yarn. One thing I’ve noticed over the past year is that the packaging has improved tremendously. Originally I received a somewhat generic plastic shipping envelope. A few months into my subscription, packaging evolved into a fun purple and white plastic shipping envelope. Over the past several months, the packaging has evolved into boxes. I absolutely love these boxes! They’re cute and reusable, and I used the last one I received as a “project box.” Yarn and needles and project (since it was small) all fit easily into the box. Skipping boxes is not the most intuitive process. But once you know where to look and how to do it, it’s pretty easy. Below is a quick video I made to demonstrate the process. 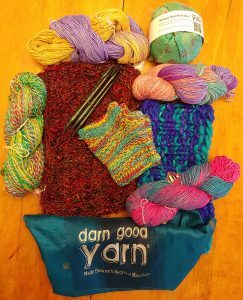 One more fun bonus of Darn Good Yarn of the Month Club is the bonus points. With every box you receive, you also get 100 “karma points.” You can exchange these for rewards like $5 and $10 gift cards. I recently used a gift card to order a journal at a steep discount. For more information about Darn Good Yarn, take a look at my other posts! Have you tried Darn Good Yarn of the Month Club? Are you curious to try it? Do you have any questions about this subscription club? Leave a comment and let me know!